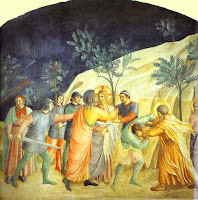 In Matthew 26:51, Matthew tells what happens when the soldiers actually stepped forward to arrest Jesus, "With that, one of Jesus’ companions reached for his sword, drew it out and struck the servant of the high priest, cutting off his ear." This is one of those stories that all four of the gospel writers cover, so it must be important. John fills in the names of the disciple (Peter) and servant (Malchus). Luke fills in the detail of Jesus performing reattachment surgery on the ear. He also informs us that it was Jesus' idea that Peter go to the garden armed in the first place (Luke 22:38). But all four writers tell about one of the apostles cutting off the ear of the servant of the High Priest. How do you imagine this story playing out. The picture at right has Peter grabbing the guys and intentionally sawing off his ear. Is that how you imagine it happening? Did Peter wake up out of a deep sleep and just lash out when he realized the enemy was upon them? Did Peter spin around like Luke Skywalker and take off the guys ear to show how good a swordsman he was? Was Peter aiming at the guys head and take of his ear because Peter wasn't such a good swordsman at all? Did Peter target the servant of the High Priest because it was High Priest was causing all the trouble for Jesus? We know from Luke 22 that the apostles had two swords. Who had the second one and why didn't they use it? Or maybe Peter was swinging both swords like a Jewish Samurai warrior? What is the point of the story? It wasn't that Jesus heals the guy whose ear is cut off-- only Luke mentions that part of the story. The point of Peter's swordplay was that Jesus refused to allow it. Jesus told Peter to have a sword and also told him not to use it. Jesus wasn't arrested because his servants were unwilling or unable to protect him. In fact, Jesus could have called legions of angels to fight for him. Jesus wants Peter and the rest to know that His arrest, trial and crucifixion were not happening by accident. No one was taking Jesus' life; He was laying it down. (John 10:17-18).